Hi everyone. 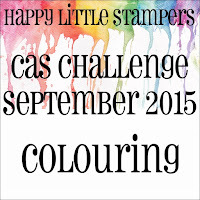 Just a reminder that we are half way through the Happy Little Stampers September Challenges. 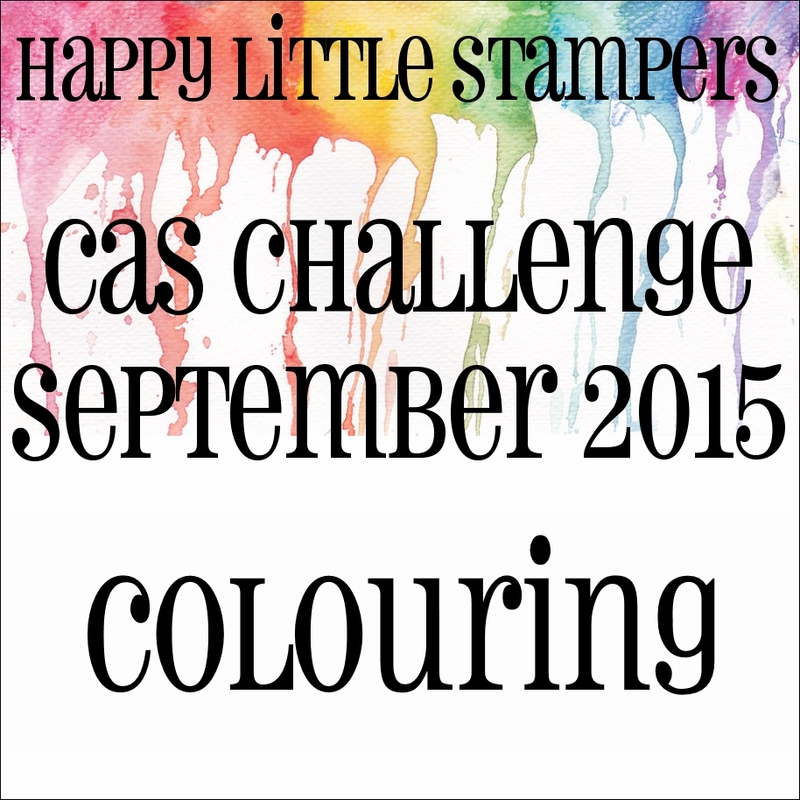 We have three challenges running this month ... CAS - Colouring, Sketch, and Christmas - Holly. I have made a card for the CAS and Christmas challenges to share with you today. I used the Watercolour Spritz Technique (that's what I call it) to colour my flowers. I coloured the stamp with water-based markers, spritzed with water and then stamped onto mixed media paper. 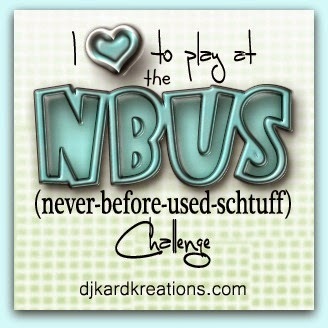 This is the first time I've inked up with stamp ... so I'm heading over to join the fun at the latest NBUS Challenge. 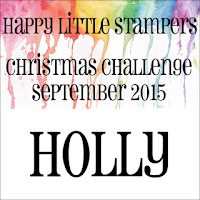 Next, is a card for the Christmas Challenge - Holly. I hope you'll join us for these fun challenges. Our Guest Designer for HLS CAS, Riti (A Lil Piece of Heaven) has made another beautiful coloured card to share. Please click HERE to see her card, along with the reminder cards from a few of our wonderful Design Team members. 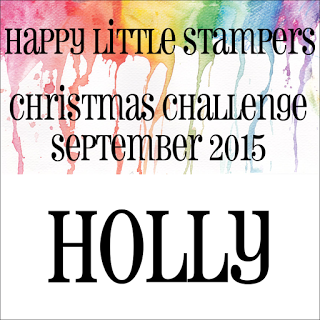 Beautiful watercolor stamping and love the holly! Lovely cards -- that holly one is fabulous! Lovely as usual. Loll! Thanks for the reminder that "coloring" can mean coloring on the stamp - I forget to think of that option! Both of your cards are beautiful. I need to try that spritzing technique. It worked perfectly on your flowers. I love how you added the rhinestone berries. Thanks for sharing. Two lovely cards Loll - love the vibrant colour of your first card and your quick Christmas card is absolutely perfect for batch card making. Love both of your reminder cards. They are so pretty. Your w/c spritzed floral is just lovely. 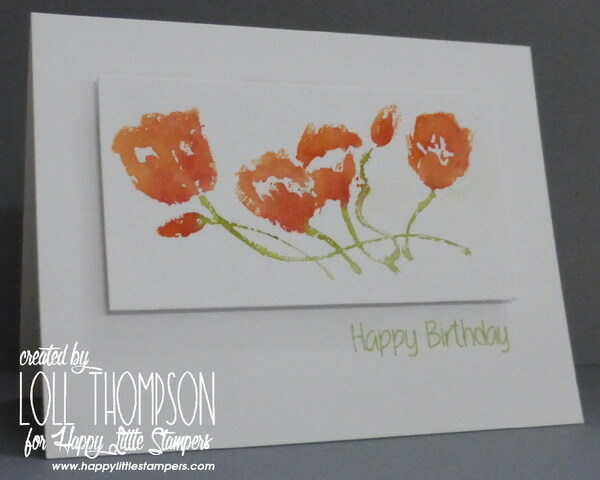 The apricot shade is so serene on this pretty stamp. And I'm loving the brilliance of the 'berries' on #2, with the sprig of holly. It's beautiful too! TFS & Hugs. What a lovely pair of cards Loll. The first one is so evocative and pretty and the second one is really stylish and CAS. Holly so beautiful sneaks up the card. Imperceptibly flows into the center and turns into a beautiful sentiment. Well thought out layout and wonderful CAS. I don't know which card I like best, but they're equally gorgeous CAS cards for sure! Beautiful!! Both are gorgeous, Loll! Fabulous job on colouring with markers and spritzing, and great use of my holly die! These are both wonderful cards, Loll. 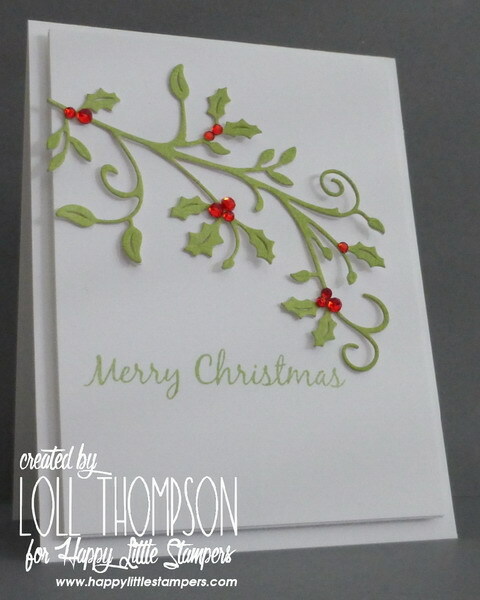 I love the crisp definition of the holly diecut, but my heart is definitely with the watercolour spritzed flowers! I love those spritzed flowers and the way you put them on a narrow panel, Loll. I also love that holly die. 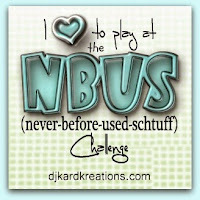 I have one so maybe I need to dig it out and make a card to enter.